Winters call for warm heavy meals that make you feel fuzzy and comfy on the inside. When mom was young, grand mom used to make different foods for her and her siblings. One of the most loved things she made was ‘Gud yo lolo’. 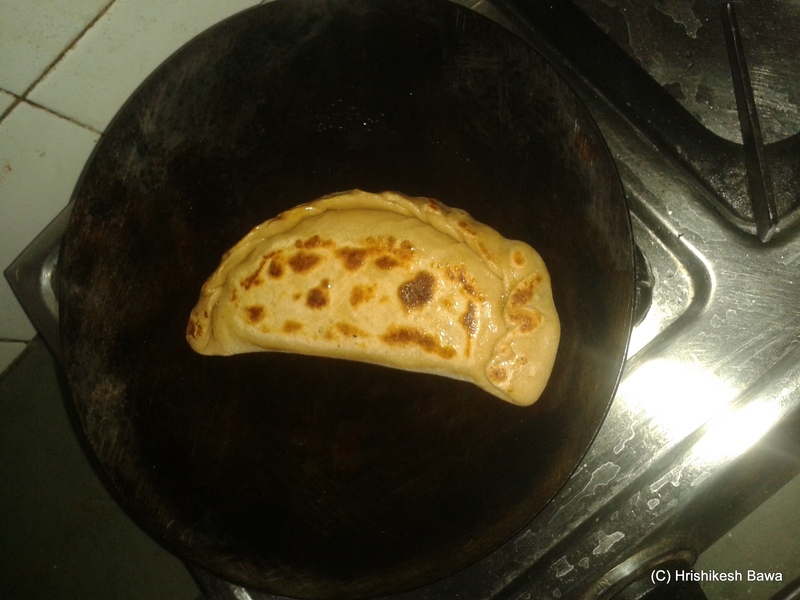 It is more like a stuffed paratha, and hence lolo (which is actually bread made with the ingredients incorporated in the dough while kneading) is a misnomer. ‘Gud’ stands for Jaggery. So this is a sweet bread stuffed with jaggery. I have inherited my mother’s love for this, and this is the recipe for it. The pictures are of mom making it. Whole wheat flour – 1 cup for each paratha. Water – to knead flour. Jaggery – 2 tablespoons for each paratha, shaved or thinly sliced. Ghee – for roasting and flavor. Take a ball of the dough. Roll it flat. Sprinkle the jaggery shreds/slices on one hemisphere. Leave 1 cm from the border which will be needed for sealing. 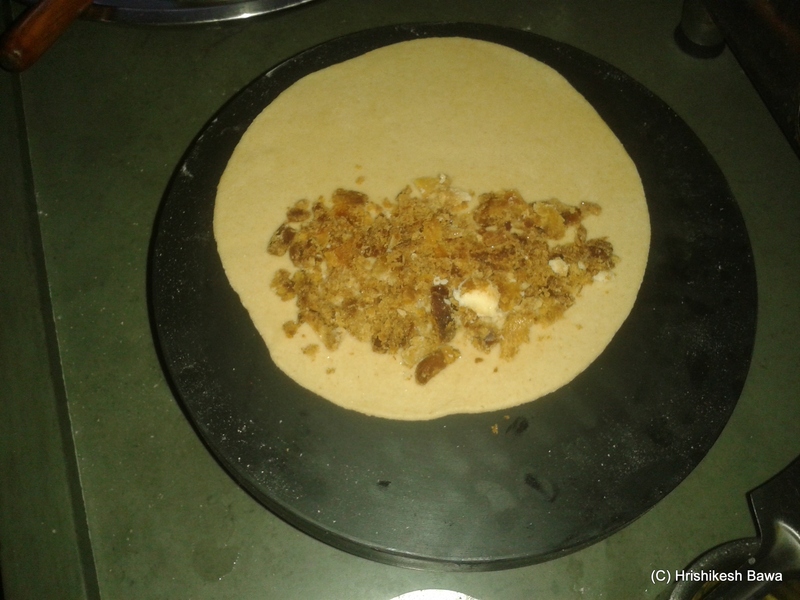 We need thin shreds/slices so that the jaggery melts easily and makes for a gooey filling. 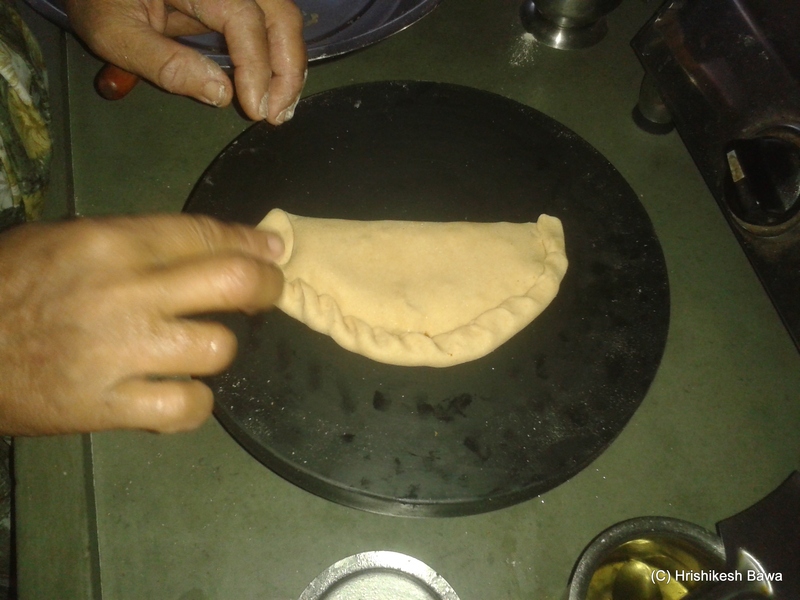 Cover this filling by closing the roti with the un-stuffed end and for a D.
Seal this by either crimping it with your hands. For that pull a small segment out, and fold it back upwards. You can alternatively use a fork to and apply pressure to seal it. Heat a tava (pan), and dab a little ghee on it. You can use a nonstick tava, and use few drops of oil but ghee leads to better flavor. Spread the melted ghee on the tava, and place the paratha on it. Gently move the paratha every 30 seconds with a spatula to prevent it from sticking. Add ghee as needed. Flip it after 2 mins. You will know it is done when the surface darkens with a nice sheen. There will be dark brown spots on it as well. Heat this side in the same manner as above. The paratha may puff a little. Take off the tava, and enjoy. You can choose how to have it. You can break it open with a spoon, and let the warm gooey jaggery paste flow out, and eat with the broken paratha. Or you can bite in to it, and let the paste flow on your fingers and lick them clean later. I find the second manner more satisfying. The key here is that if you break it open the moment you take it off the tava, the molten jaggery might be too hot for you. Let it stay for more than 5 mins and it will cool and start to solidify. Generally you can wait for 1-2 mins so that it warm enough to flow down your fingers but not hot enough to hurt. Man you have some sweet tooth! This is a roti version of gujjias…similar. This seems healthy. Will make it for sure. Wow!! This is so cool and so easy too!! 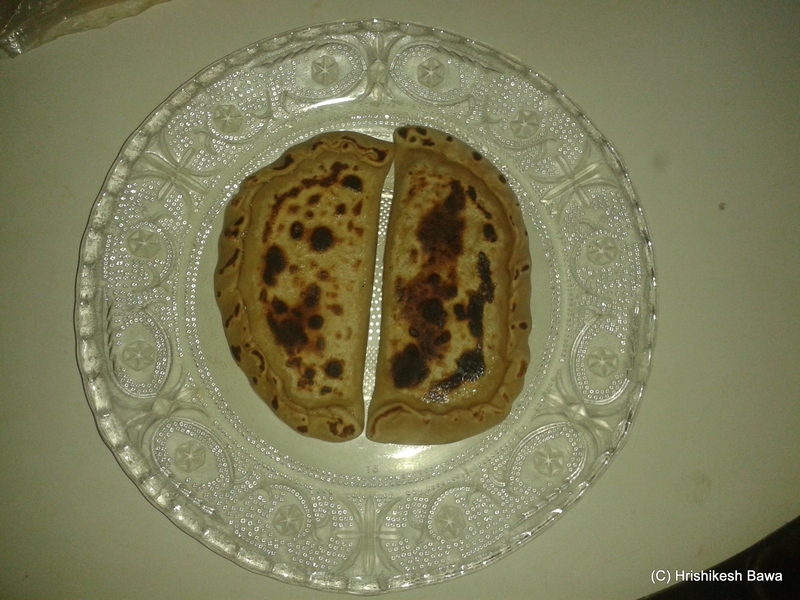 I love Pooran Poli made by Maharashtrians but it has a bit lengthy preparation. But this one is so simple… can be made anytime. I am gonna try this sooon!! Thanks for sharing such a fab recipe! 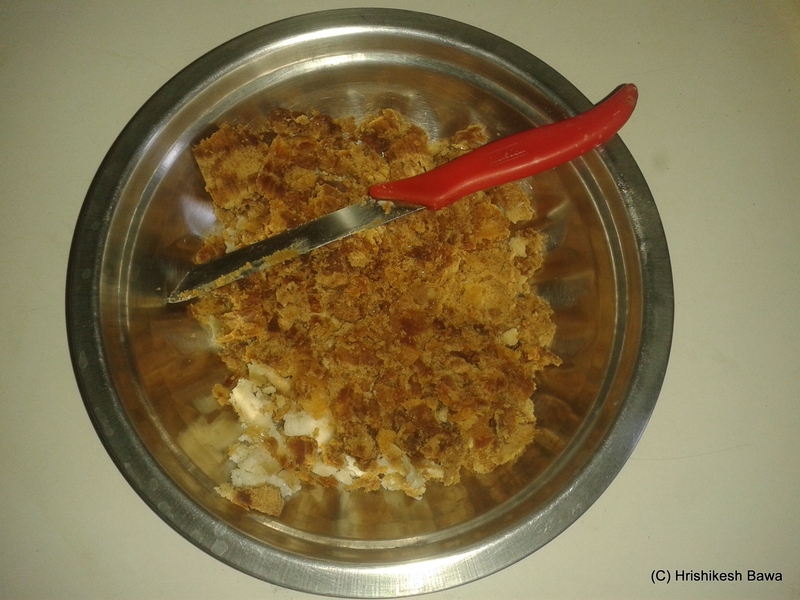 We make another version by mixing jaggery and grated coconut with wheat flour to make a wet dough. This is then spread on the tawa with fingers and roasted with some ghee. Yep, it does look like gujhiya. Seems very simple. I have never made sweet parathas for my kids. Perhaps, they will like it. I remember my mom making one with sugar and some dry fruit stuffing to be had with kheer :). We can also stuff chocolate fillings in a similar manner to make a choco lava roti, na? Reminds me of a puran poli ~ perhaps the easier version of the same! this is yummy and healthy too. I will add fresh coconut to it. will try out. each step is well-explained with photos. I have been drooling over this post since the time you wrote it!! PS – is there a search function on the blog? I’m wondering if I am totally nuts cos I couldn’t find it and so, this post!